Sometime back in general chemistry you (hopefully) learned that hydroxide ion (HO-) is a strong base. It’s the conjugate base of water – that is to say, that’s what’s left behind once we’ve ripped a proton (H+) off of it. Likewise, alcohols (ROH) are strong bases too – once you remove the proton to get the conjugate base (RO-). Similar in strength to the hydroxide ion, these are called alkoxides. Potassium t-butoxide is like a really angry Sumo wrestler. It attacks things that are out in the open with fierce and sturdy determination. However, anything that requires the least bit of navigation through a narrow opening (like a doorway) is going to be difficult. In the chemical sense, this means that t-butoxide is very sensitive to steric interactions. (What are “steric interactions” ? Think about 4 hungry Sumos trying to fit themselves around your tiny dinner table). More specifically, steric interactions are the repulsive interactions between electron clouds that happens when atoms “bump” into each other. So what does this mean for the chemical reactions of t-butoxide? Two things. t-butoxide is a poorer nucleophile than smaller alkoxides (like ethoxide, methoxide and so on) in nucleophilic substitution reactions (like the SN2). Why? Because the SN2 is very sensitive to steric interactions, and t-butoxide is bulky. t-butoxide can be used to form the “less substituted” alkenes in elimination reactions (the E2, specifically). 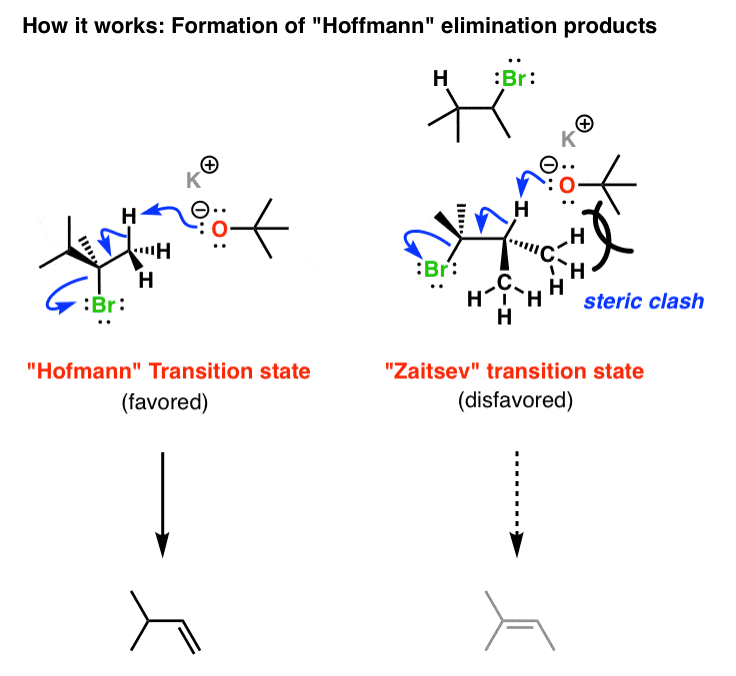 Most of the time, elimination reactions favor the “more substituted” alkene – that is, the Zaitsev product. However, when t-butoxide is used, it will preferentially remove the proton from the smaller group. This produces the so-called “Hoffmann” product. Let’s have a look. So how does it work? Let’s have a closer look. If you’ve read parts of this blog before, you might recognize this effect. That’s because t-butoxide’s tendency to break Zaitsev’s rule is on of the most annoying exceptions in organic chemistry 1. But when you want to use a strong, bulky, poorly-nucleophilic base, potassium t-butoxide is a good choice. I’m curious to know: if the leaving group and the hydrogen are not antiperiplanar, can the molecule be rotated so that they are in order to do an E2 reaction. Can t-butanol, not t-butoxide, engage in an E1 reaction? Yes, if the reaction is heated. When you say ”it will preferentially remove the proton from the smaller group”, do you mean the least substituted group?? Also the Zaitsev rule state that ”the poorer get poorer” (in Hydrogen), is that why it favours the ”more substituted alkene”? (less hydrogens= more functional groups= more substituted)? Yes, the hydrogen should be removed from the least substituted group (e.g. CH3 vs. CH2CH3) in the case of KOtBu. Zaitsev favors the “most substituted alkene” because these tend to be more thermodynamically stable. The reason takes a while to explain – it involves hyper conjugation. I don’t go into that here. Even if tert-butoxide is sterically large, can it engage in Sn2 reactions if the leaving group is primary? If so, would that mean tert-butoxide was in fact a strong nucleophile, just that it cannot be a nucleophile if the substrate is secondary. Can we use tert-Butoxide for the removal of hydrogen from -OH group. After the removal of the hydrogen on pentanol, would a double bond form or would oxygen carry -1 charge? Oxygen would carry a -1 charge. Ain’t nuthin’ gonna make the O- leave to form a double bond after that! Yeah, but you’ll set up an equilibrium between your secondary alkoxide and t-butoxide. So make sure you add it in excess. Is secondary butoxide should also consider as bulky base? What will be the good solvent to dissolve potassium tert-butoxide except water? The best solvent for potassium t-butoxide is tert-butanol. All other alcohols will result in mixtures of alcohols / alkoxides. can we use tert-Butoxide to remove sulfur from ring compounds? does the mechanism stay the same? You’d have to attach a picture of what you’re trying to do. Dissolve in a solvent like diethyl ether or THF, then add potassium hydride. Best website on the internet for organic chemistry concepts . Thank you so much ! Glad you find it useful Vivek!